After Friday and Saturday in Dallas looking at art, you would think I'd be satiated. Wrong. I found out that a gallery I had heard good things about was open on Sunday. This was the Webb Gallery in Waxahachie, which is between DFW and Houston. So I programmed my car's navigation and headed there. 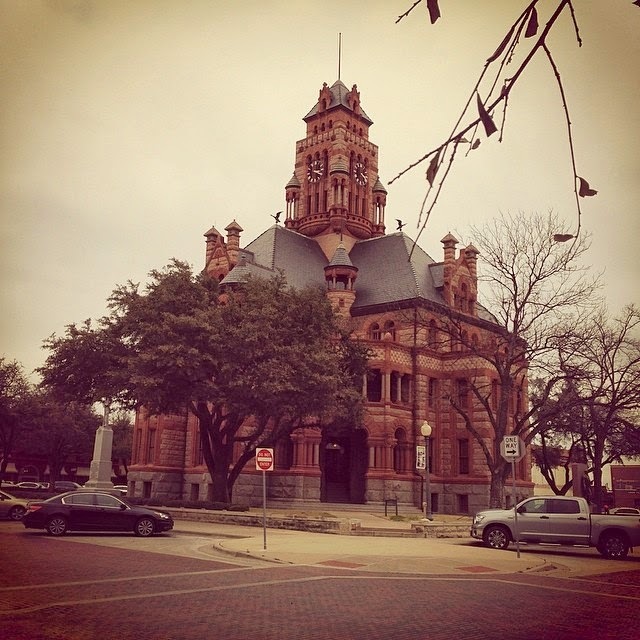 Waxahachie is the country seat of Ellis County and has a beautiful courthouse. (I kind of goosed up the "haunted house" look by adding an Instagram filter.) The town is pretty rural and has a population of a little over 21,000. The downtown is quite beautiful, but unfortunately it seems like most of the commerce takes place on highways in big box stores. Still, there were plenty of small businesses downtown. I ate at a nice Mexican family restaurant there. And then there's the Webb Gallery. Many small towns have antique stores and junk shops, and from the outside that's what Webb Gallery looks like. But it is something altogether different on the inside. The objects they have inside include outsider art, folk art, super-weird items picked up in flea markets, unclassifiable art by contemporary artists, lowbrow art, carnival art, etc. It is similar in some ways to Yard Dog in Austin, but much bigger (real estate in Waxahachie must be cheaper than on S. Congress Street). And the size of the gallery permits it to show some amazing large pieces. As befitting its merchandise, the Webb Gallery eschews the standard "white cube" model. It goes for clutter, and clutter encourages browsing and discovery. The gallery is owned by Bruce and Julie Webb, but unfortunately they were in Fort Worth for the day. Manning the store was Brian K. Scott, an artist from Dallas who worked part time here. He showed me some linoleum blocks (for printing) he had done that look incredible! I can't wait to see them printed. Obviously Webb Gallery doesn't depend solely on the good people of Waxahachie for income. It needs collectors from Dallas and Fort Worth (and the occasional Houstonian like me) to make the trip. I assume that's why they are open on Sunday so they can catch these weekend day-trippers. The current exhibit is called Big Hair and Sparkly Pants, a Texas-oriented group show. The contents ranged from Stanley Mouse rock posters for the 13th Floor Elevators to somewhat conceptual sculptures by great Texas songwriter/musician Joe Ely. I also liked Ike E. Morgan's paintings of Sam Houston, which were displayed underneath his huge portraits of George Washington. So I bought it. But I wasn't through browsing--as I said above, the cluttered nature of the gallery encourages searching through its nooks and crannies. I had noticed the large Charlie Stagg sculpture (see below). This tiny desk-top sculpture used Stagg's standard triangular helix construction and then added an extra twist in on itself. Stagg (1940-2012) unlike Morgan could not be considered an outsider artist. He had a MFA from an elite art school (the Tyler School of Art at Temple University), taught art, was represented by East Coast galleries, etc. But in 1981, he moved back to his hometown of Vidor, Texas and started producing works like these as well as building his visionary art environment on a large wooded property his family owned. I had seen some of Stagg's work at AMSET, but was astonished to find it for sale in Waxahachie. The price couldn't be beat, either. So I ended up buying it, too. After I bought these two pieces, Brian Scott pulled out the celebratory beers and we spent an hour or so chatting about Charlie Stagg and the art scene in Dallas while playing with the gallery's two dogs, who craved attention. That, I have to say, was the perfect gallery experience. If you're driving to Dallas or Fort Worth, swing by the Webb Gallery on the way. It's well worth the small detour.